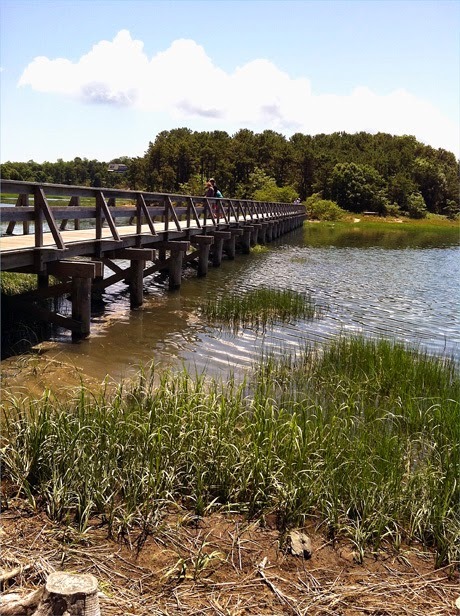 Uncle Tim's Bridge in Wellfleet. As I described in my last post about clearing out and selling our beloved house in Madison, we were working dawn to dark sorting boxes, rummaging through the basement and attic, and generally making hard choices about what to toss, what to sell and what to keep. But, two weeks into our agenda, we were scheduled to fly to Boston, then drive to Cape Cod to attend the wedding of a close friend's son. As the departure date loomed, I felt like I'd made a big mistake taking five days off for some — gasp — fun. Once we arrived, though, I have to say, I knew we had made the right choice. 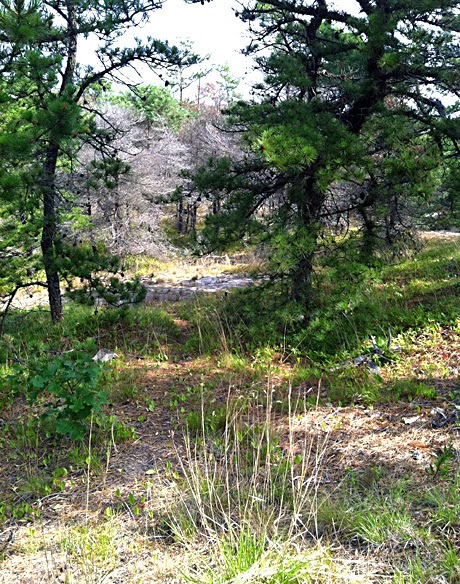 The wedding was in Wellfleet, and we stayed in South Wellfleet — such a peaceful, tranquil place. It didn't take very long to forget about Madison and sink right into the beachy mood. Who can be stressed out when they are on a beach? An ocean beach on a warm summer day. What can I add to that? 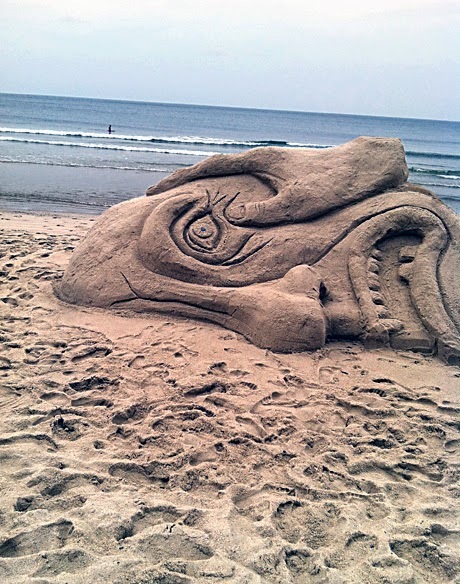 A sand sculpture, maybe? No, I didn't build it — I was just an admirer. The event itself wasn't on the beach. It was held outside, in town at a lovely old hotel, under a canopy, in perfect weather. The wedding was so much fun — the ceremony was beautiful, the toasts offered to the bride and groom by family and friends were incredible — the stories shared so heartfelt and spellbinding, it was obvious that Forrest and Katie were destined to be together forever. 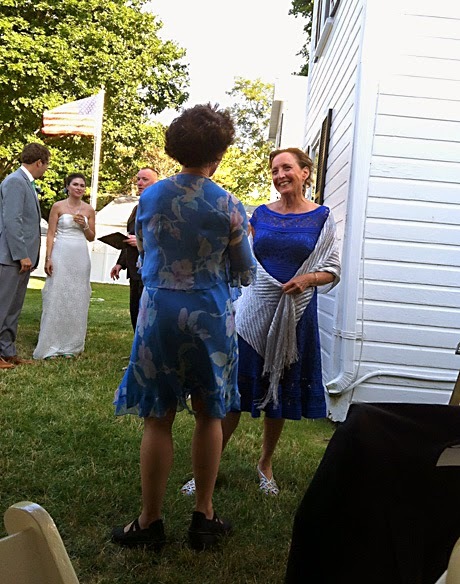 My dear friend, Helene, with son Forest and new d-i-l Katie in the background. But let's get right to the subject my vegan foodie friends are waiting for — the food. I admit I was a little skeptical about what we would be eating. The return card with the invitation had a place to check off whether we wanted meat, seafood or vegetarian food, and I gamely wrote "vegan," not knowing what to expect. Based on past experience, I was expecting lukewarm pasta and a salad, and I was OK with that. I just wanted to be there no matter what. I didn't say anything about being gluten-free because I didn't want to cause any trouble, and was OK with the idea of eating a salad. 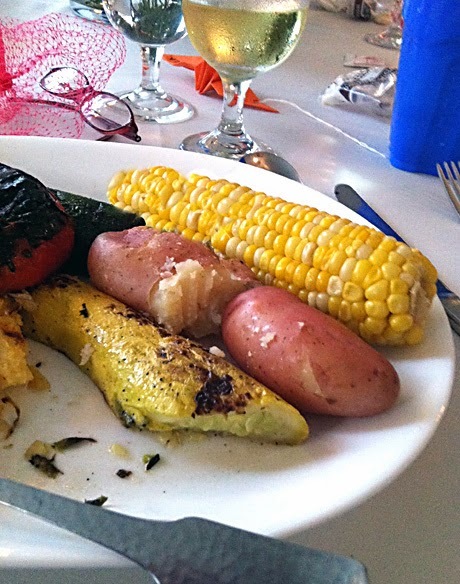 Luscious grilled squash, potato and corn. The first course was clam chowder, and there were no vegetarian or vegan options. We sat there exchanging glances while our omnivore table mates yummed it up. You know how it is sometimes. Oh well. 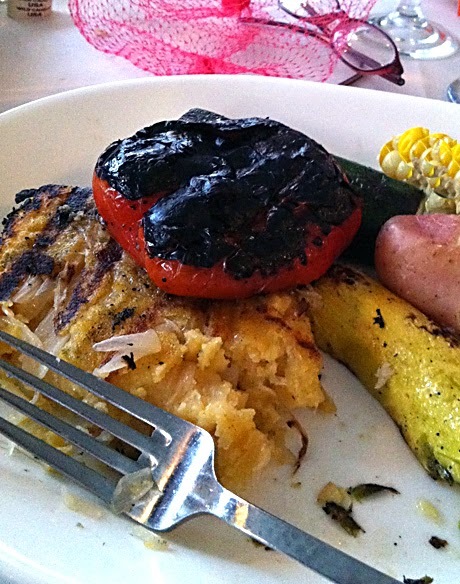 Then the tables were individually called up to the buffet and we got a HUGE surprise — giant plates heaped with gorgeous, perfectly grilled veggies served next to a large square of polenta enhanced with caramelized onions. The vegan entrees, I might add, were in their own buffet server, separate from the non-veg items. I had made considerable progress on my plate before I remembered to take out my phone and snap a few photos. I should have brought my camera. Crazy delicious grilled polenta and charred red pepper. Everything was exquisite — my kind of food, exactly. 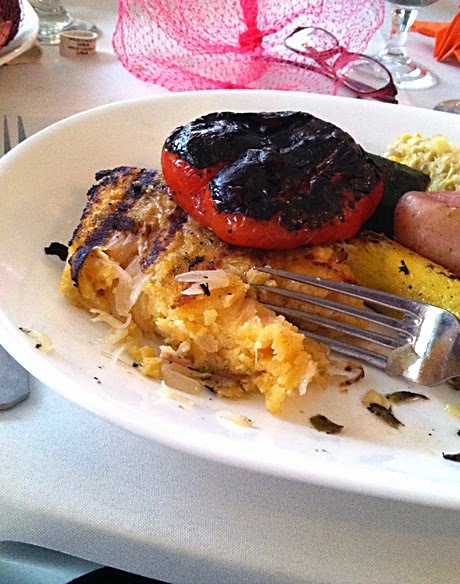 Everything was perfectly cooked and seasoned; I've never had such an amazing polenta dish. I was so stuffed and happy I didn't even care that the vegans were not offered dessert. I don't think I could have eaten dessert without exploding. In order to work through the food stupor, I danced hard and long, pausing just long enough to capture a bit of the fun for posterity. 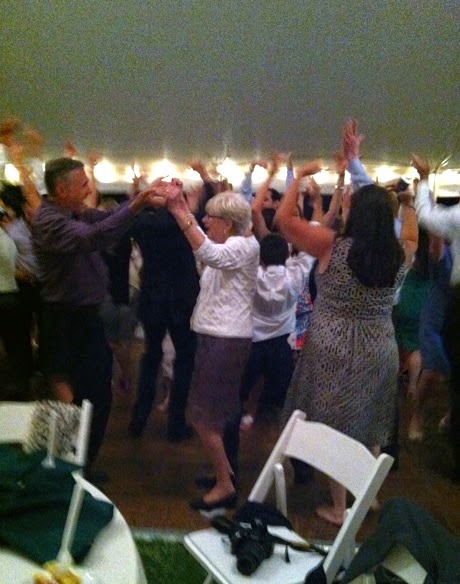 The woman in the white jacket you see whooping it up in the above photos is Helene's 90-something-year-old aunt. 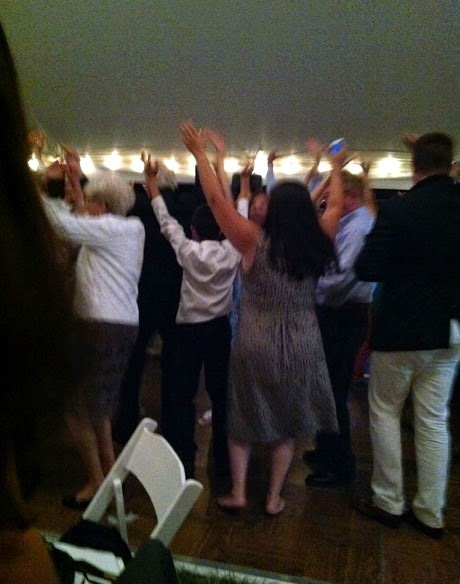 Way to go, Aunt Honey. We hiked a path through the forest to the beach. The day after the wedding we took a little excursion to Provincetown, stopping on the way to explore the National Seashore. 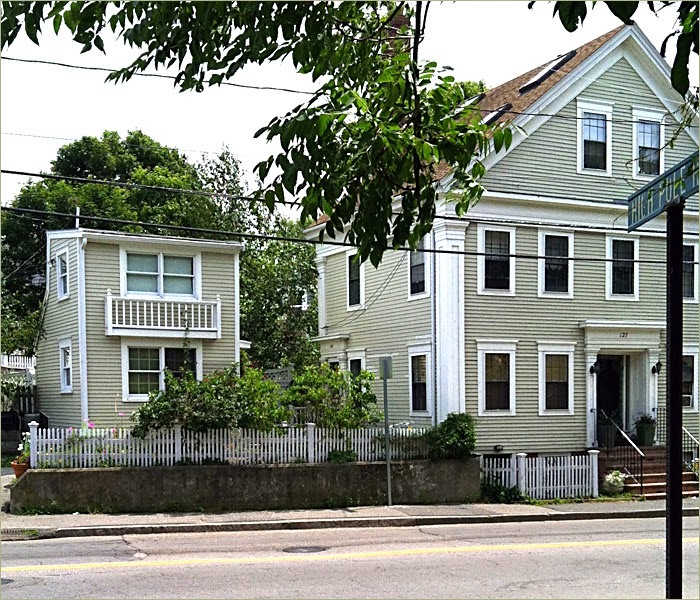 Typical charming buildings in Provincetown. 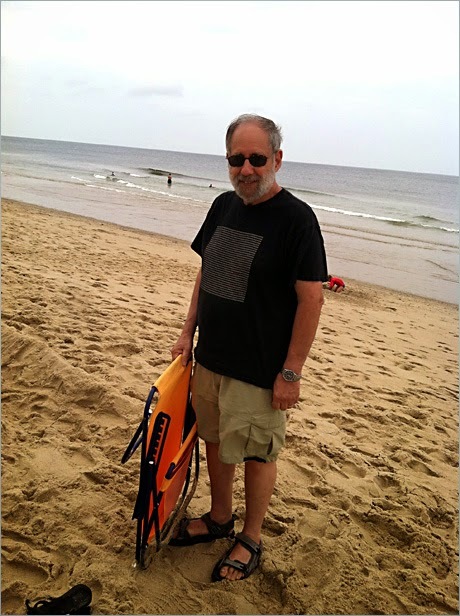 After spending time at the beach, we headed into P-town, where we hadn't been in so many years I couldn't recognize it. It was still reeking with charm, but very crowded and bustling — so many people, galleries, shops, activity. After being there for a while, visiting cool galleries and shops, we realized that what we were truly seeking was tranquility, and decided to grab lunch and head back to Wellfleet. The place that looked best to us was the 141 Market — a natural foods store with a by-the pound hot bar and tables. 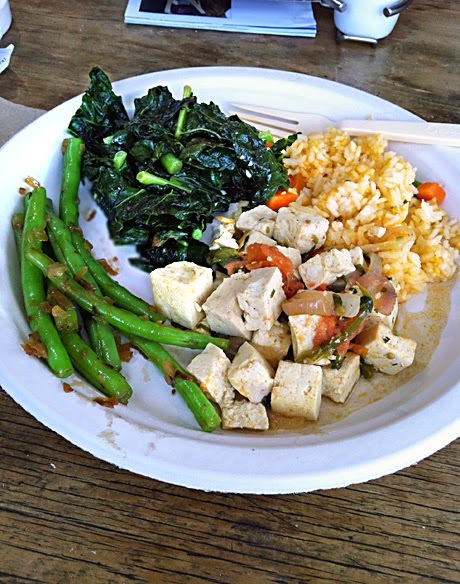 There were separate areas for vegan and non-vegan food, and we were able to find a delicious selection of items. Later in the afternoon we hung out with our friends on a beach in Wellfleet, then made plans for dinner. We were supposed to gather at my friend's vacation rental and have dinner there with her family and friends. Unfortunately, our plans and communications got scrambled, and we were unable to find her address or reach anyone by phone. We finally gave up and went out to dinner at Karoo Kafe, a charming restaurant in Eastham serving South African cuisine. 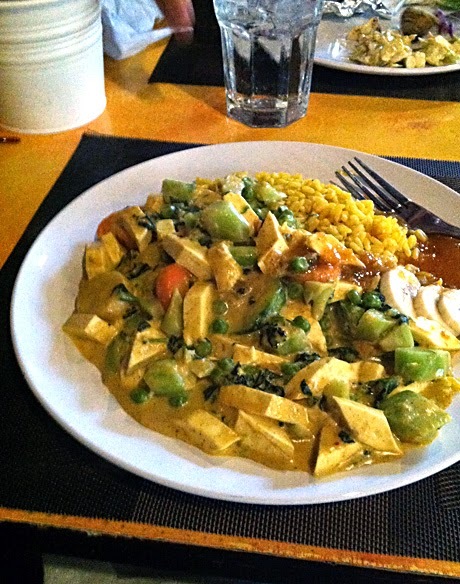 I think I had Cape Malay Stew with tofu, which was delicious. The menu was clearly marked with vegan as well as gluten-free items, and the waitress was extremely knowledgeable and helpful. Just as our food arrived, my phone rang with a distraught Helene wondering where we were. We straightened everything out, ate our delicious food, and headed to the house for more merriment. It looks like I failed to take any more photos on Cape Cod so you'll just have to believe me that we continued having a fabulous time for one more day, and enjoyed a wonderful cookout at the beach house the next night. An excellent time was had by all. Don't forget to leave a comment on my HappyCow Cookbook post to be eligible to win a free copy of the cookbook.